In Triple Triad you have a board with 9 available slots where cards can be placed by you or your opponent. Each of you have 5 cards to begin with which are either red or blue, the aim is to turn your opponent cards to your colour. At the start of a match you and your opponent will start with a score of 5. This score resembles how many cards are your colour and vice versa for your opponent. As you turn opponent cards to your colour you will gain a point, if your opponent turns one of your cards to their colour you will loose a point. 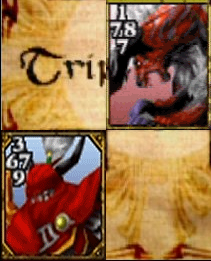 All Triple Triad cards have 4 values facing up/down/left/right, these values are used against other cards to determine if you will flip a card to your colour. This works by placing cards next to each other, facing values are then compared to determine the result. Here you will see a card has been placed on the board with a slot open to the right. Note that the card we've placed has a right-facing value of 4. Now, you'll see we've placed a card to the right of this one, with a left facing value of 8. 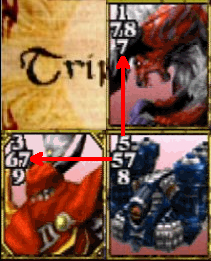 As the card was placed, the values facing each other were compared (4 vs. 8), because 8 is greater than 4 this resulted in a flip and the original card was turned red. Note that this cannot work the opposite way, if you place a card where the facing value is greater than your card it will not result in your card being flipped, simply nothing will happen. That's the basic Triple Triad gameplay, keep in mind Game Rules can modify/extend how the game is played out, these are explained below. With the Open rule both you and your opponent can see each others deck during a match before cards are placed on the board. This allows you to anticipate future moves more accurately knowing what you're up against. Without the Open Rule you will only see your opponents cards once they have been placed on the board. The combo rule allows potential flips to occur after a Special Rule (card flipped via: Same, Same Wall or Plus) has occured. Any card flipped by a special rule can then flip further touching cards using the standard rule. The same rule modifies how cards can be flipped. The standard rule is to flip cards whose touching value is greater (x > y), however with the same rule you can also do x == y. This rule cannot be invoked on a single card, x == y must apply to at least 2 adjacent cards just like the Plus rule. Note that the values matched do not need to be the same, if you encountered 3 facing 3 and 5 facing 5 the rule would invoke. As a result, you have 3 = 3 and A = A, two Same matches that invoke a flip but under the Same Wall rule. In simpler terms Same Wall is just like Same, only it allows you to only match values of 1 card and the wall. The plus rule allows facing values to act in an additional way to the standard rule (x > y), it allows values to be added together with 2 or more facing values, if 2 or more of those facing values add up to the same value a flip will occur. As a result of this, 7+5 = 7+5. The plus rule will activate flipping any cards that match the plus math to your colour. Note that the plus rule only requires one opponent card to be part of the math, as the example shows the other card was already yours. Additionally the plus rule can work to flip 3 or even 4 cards in the right situations. With the Random rule activated neither player will be able to choose their cards. Cards will be chosen at random for you at the start of the match. With the Sudden Death rule if the game ends in a Draw (both players have a score of 5), then the board will be wiped clean and all cards currently your colour will be handed to you, and vice versa for your opponent. This means you might be playing with cards you've flipped during the course of the match, this is only temporary for the match and it doesn't mean you'll have those cards at the end. The match will continue until someone wins no matter how many draws are encountered. As a result, a +1 shows to visually represent all card values are now increased by 1. The opposite will occur if a card with no element or mis-matched element is placed ontop of an elemental position, resulting in -1 showing. Note that this modifier is treated with lowest priority when rules occur, the modified values are not considered when special rules are executing (Same, Same Wall, Plus). The modified values will only be considered during Combo or the Standard Rule (x > y). With One as the victory rule, the winner of the match will be allowed to take one card from the opponents deck that they played with to keep. With Direct, both the winner and loser of a match can have cards. Whatever cards are in your colour at the end of the match will become yours, however any cards not your colour will be lost if they were originally yours. With Difference, the winner will be able to take the number of cards based on the score difference. For example, if the match ends 7 - 3, the winner gets to take 4 cards. Note that the maximum cards the winner may take is 5 even if the result of difference is higher. With the All rule, the winner simply gets to take all the opponents cards they played with.